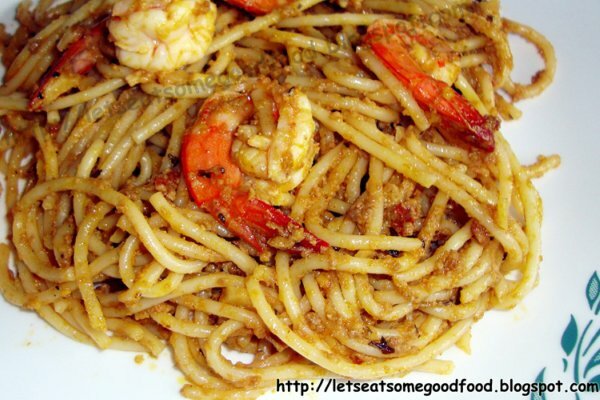 Quick Shrimp Recipes – Aligue and Shrimp Pasta – Eats Yummy! Aligue and Shrimp Pasta Recipe is what we thought of preparing when looking for quick shrimp recipes to cook. This shrimp pasta recipe that is a primary entry to our seafood pasta recipe and one among our favorite easy pasta recipes. Actually, this recipe for shrimp scampi made us started our food blog as mentioned in our first blog post. At that time, we were thinking of easy dinner recipes for two and what to cook with shrimp that we just bought from the nearby supermarket. So, we looked over some shrimp pasta recipes in Ana’s collection of cookbooks. Afterward, we then decided to share our food adventures. A lot of people are enthusiasts of shrimp scampi recipes but aligue (crab fat/crab roe/crab gut) being fatty is arguably believed to be not for the ones with weak heart. This may be the case but as long as you do not overindulge, aligue is not really a serious threat. But of course, for people with heart problems, you may consult your physician before eating pasta dishes with aligue. In any case that you are looking for healthy dinner ideas, you may also want to check and try other healthy pasta recipes as alternatives or options. In my opinion, this seafood pasta recipe is a heaven, especially for a seafood and pasta lover. The first time I encountered Aligue and Shrimp Pasta Recipe was actually about 9 years ago when I had a dinner in one of the seafood restaurants in Manila Bay. Another instance was when we visited a restaurant in Pasig a few years after. At the present, I always try shrimp meals whenever possible especially when I am out of easy dinner ideas. One good thing about quick shrimp recipes besides it saves time to cook, it still maintains its the flavor. The aligue sauce makes the pasta unctuous, it combines well with shrimp. Consequently, I find this tasty shrimp recipe really good not just because I love seafood but because it has a unique flavor. If you are not into going out or doesn’t want to search for restaurants nearby, just fill your appetite with healthy pasta recipes. You can cook easy dinner ideas like this in your very own kitchen. Meals with shrimp like this may not be the usual shrimp pasta recipe that you know. 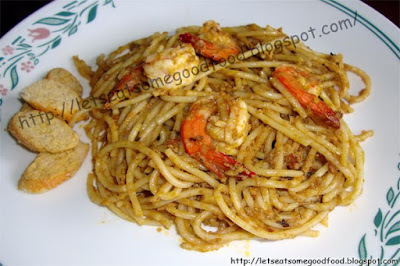 But cooking Aligue and Shrimp Pasta Recipe a is an easy recipe to prepare and cook. In addition to that, you do not have to be a pro to prepare and cook quick shrimp recipes. Additional note, if you are looking for other healthy options, you can also check one of our easy food recipe. Also, you may add more chili if you are into spicy shrimp recipes as well. Read below for to start cooking one of the best shrimp recipe ideas that we can share. First, fill a stockpot with water. The more the better. Pasta sticks when cooked in too little water. Then, add a pinch salt. This is a must. Adding oil will make the pasta slippery, making the sauce not to stick to it when it is done. Bring the water to boil and slowly add the pasta. Gently stir to avoid the pasta from sticking while preventing the pasta to break. Pasta cooks in 10-12 minutes. Check package direction too. Get one and check if the pasta is cooked already. It should be firm yet tender with a tiny core in the middle. You may save some pasta water from cooking the noodles and use it to dilute the sauce. Add the aligue, shrimps, then add the soup stock. Bring to a simmer. Simmer slowly to reduce the stock. Finally, transfer to a plate and top with Parmesan cheese before serving. Cook the pasta while cooking the sauce. As it cooks under 30 minutes, it is one of our quick shrimp recipes. Try it at home especially when looking for shrimp dinner ideas or shrimp dinner recipes and share your experience with us by commenting below. 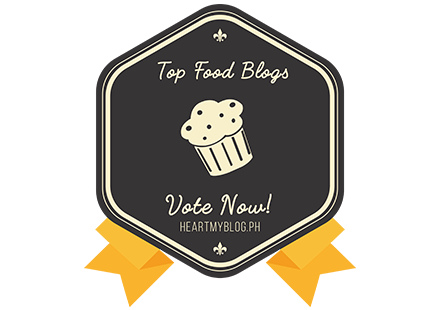 Moreover, feel free to share our post for home cooking recipes if you find it helpful and delicious. If you are into other types of noodles, you may also want to check our pansit bihon recipe post to see where you can find the best noodles. I love simple yet delicious pasta recipes. I'll have to give this a try. Delicious!. I want to prepare this recipe. You are giving detailed and new recipe with us. It’s very unique one for me. Thank you for sharing wonderful recipe!